NB: This is googles most up-to-date satellite image. Since it was taken, new properties have been built which have in no way impacted or disturbed any of our guests, many who have been returning over the last decade to stay each year in Tigh na Mara. There are some great places to visit and things to do nearby! Close by Tigh na Mara is a local potter and pottery, and Shilasdair, the Skye yarn company. Skye Skyns a family-run sheepskin business established in 1983, and the Skye Cottage Museum where several original crofts have been restored. Fifteen miles away is the dramatic Dunvegan Castle, one of the oldest inhabited castles in Scotland, which is set amongst beautiful gardens on the edge of Loch Dunvegan. From here you can enjoy a boat trip out to the local seal breeding colonies along the coast. If you drive to the east side of Loch Snizort (33 miles) you will find Monkstadt, where Flora Macdonald brought Bonnie Prince Charlie to safety in 1746. Skye has many fishing and crofting villages, townships, ancient ruins and standing stones to explore. 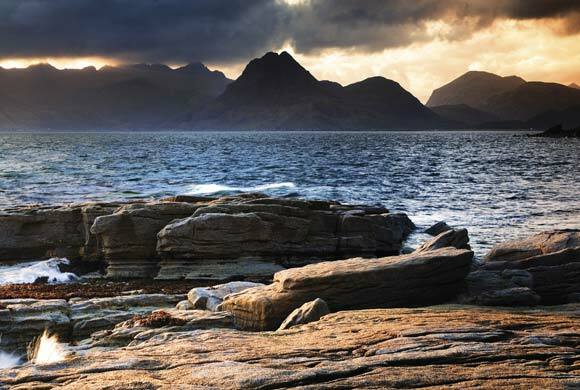 To the south of the island are the scenic and dramatic Cuillin Hills that dominate the skyline amongst breathtaking scenery. The mountains give plenty of scope for walkers and climbers with 15 Munro’s, (mountains higher than 3,000 ft) to carefully walk.